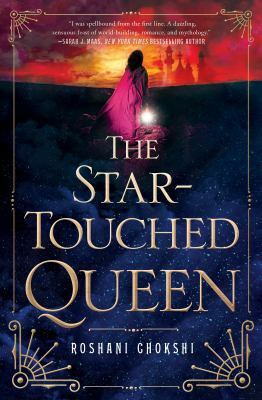 Posted on April 18, 2017 by Maya S.
Beautifully illustrated from the first line, Chokshi’s fantastical The Star Touched Queen shows the path an Indian queen who finds her way to the light. Through thick and thin, obstacles and triumphs, Mayavati searches from hiding behind her own shadows to grasping the stars that lay above her. My favorite part of the novel was the writing style, especially the amazing imagery used when describing the young queen’s journey. Mayavati, a very dynamic character, grew along with the words throughout the tale. At the start, when her story was a routine of palace life and a shameful astrology, the vocabulary chosen was more ominous. However, there was always a light, a small hope, which rose and fell as Maya (for short) ventured through the times. And, upon reaching the final few chapters, the writing climaxed to a breath of new life. At the same time the queen was a strong, ferocious, and gallant leader, she was still the vulnerable seventeen-year-old introduced at the start of the novel. This clashing of alternate personalities describes teenagers very well. So, it always brought me back to the song “Vincent” by Don McLean. The piece, emotional and ballad-like, tells the story of Vincent Van Gogh. The first line, “Starry, starry night” is a reference to one of his most famous paintings. But, it also ties in well with Mayavati’s destiny. The two are both artists: one, an illustrator of life and the other, a storyteller. I can usually sense when a book is an author’s first publication. However, in Chokshi’s case, the novel was very well written, and she was able to truly capture the life of the characters. In addition, I have no doubt her second book, released in March of this year, will be no different. It will be in the same universe, but delving more into characters briefly introduced in The Star Touched Queen. This first book; however, was one of those novels which olds a special place and one I will definitely read again. So, if you are intrigued, check it out! The Star Touched Queen by Roshani Chokshi is available for checkout from the Mission Viejo Library.